We all receive direct mail pieces that get thrown by the wayside. But what is it that makes one stand out from the pack? In the spirit of Send a Card to a Friend Day coming up Friday, I want to cover a few out-of-the-box direct mail production options that, when paired with the right strategy, could really make an impression on your audience. 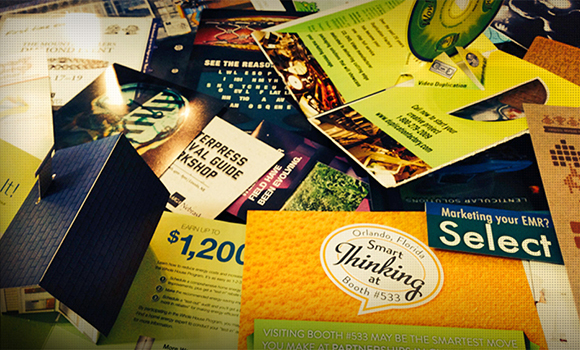 The sense of touch is one distinct advantage that direct mail has over electronic communication. The touch and feel of a direct mail piece help establish a personal connection with the recipient. This may be enhanced by a few special techniques you can see in the short video below. The indention of the type, the thickness of the paper, even the slight variation from piece to piece let you know the message is unique. Innovative print shops have even started to add elements to the paper, like seeds that allow you to plant your direct mail after the message has been delivered. Embossing elements so they stand out in relief, or debossing elements so they are indented, has long been a way to add elegance and class to a direct mail piece. Dimensional clear coating is a fairly new advancement in printing that allows you to simulate an embossed texture by adding a layer of clear coating that is raised in select areas. This is a much more cost-efficient way to add a unique feel without the high cost of creating a die for embossing. Visual effects are another way to make direct mail pieces stand out, whether by implying movement or by simply using different visual techniques in new ways. Lenticular printing is used to produce printed images while giving images the ability to change or move as they are viewed from different angles. This technique started out as a novelty, but when used correctly, enables you to show products and services in motion. In 2003, the USPS created a unique category of mail called Customized MarketMail. This allows uniquely shaped mail to be sent without a box or envelope. These pieces can be printed on a plastic that accepts ink and can flex without creasing, but must be produced by approved vendors. Die-cutting is the process of cutting paper or other materials into a special shape or design with the use of special sharp steel die. The technique can be applied to standard-format mail pieces to add interest, or the whole piece can be cut into a custom shape and contained in an envelope or mailed independently when designated as Customized MarketMail. Interactive mail pieces have a cool factor that can’t be denied. From 3D pop-ups to pull-tab motion, they invoke a sense of childlike wonder that you can’t help but share with others. “Cool” comes with a price, but when targeted at qualified leads, interactive pieces can make a statement. These techniques may not be the right fit for every message, strategy or budget, but they may give you a few ideas to get you thinking differently about your direct mail campaign. Seen any printing techniques you’ve liked lately? Let us know in the comments below.